The CAF-Draw Through “Large” Filtered Explosion Proof (and non explosion proof) fans are designed for the customer that needs a larger volume of CFM airflow (than our smaller units can provide). 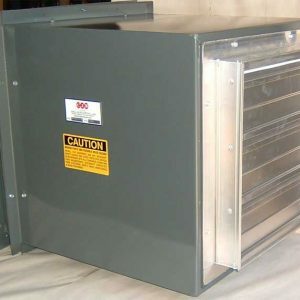 With unit sizes of 36”, 42”, 48”, and 60”, a customer can ventilate a very large space, with fewer fan units. THESE FANS CAN ALSO BE CONFIGURED FOR FILTERED SUPPLY AIR, (as well as exhaust). Filter Box MUST HAVE INDEPENDENT SUPPORT (by others).